I’ve been working on some painting projects around my house lately. A few years ago, a friend who is very experienced with painting shared a tip with me. It has saved me a lot of money AND time! It’s not often that something will make things both easier AND cheaper! What is this amazing trick? When you’re going to need 2 coats (and you almost always will), buy one can of paint and one can of tinted latex primer. Tinted primer is a can of primer that has been tinted with a colorant, just like paint. Every brand of primer I’ve seen has been able to be tinted. You just ask the paint associate to tint it similar to the wall color you’ve chosen. They will likely inform you that the color match will not be exact because the color of the primer is not the same as the paint base color. If you’re using a very dark color, you might not be able to tint all the way to that color, but you can get close. Why Should You Buy Tinted Primer? Primer is MUCH CHEAPER than paint. A gallon of quality primer ranges from about $14-20, compared to quality paint that runs from about $25-60+. Primer is about 50% of the price of paint. Seals in stains. Have walls with greasy stains, odors, or water stains? No problem! The primer will seal it in. Covers old colors much better. Going from navy blue to beige? Primer makes it a breeze! Paint goes on smoothly. Painting a freshly primed wall is so nice! Can buy cheaper paint. If you’re doing primer first, there’s no need to buy fancy “paint & primer in one” types of paint. From experience, I can tell you that a coat of primer plus a coat of paint is way nice than a single coat of paint-and-primer-in-one anyway. Isn’t Primer Difficult to Work With? You may have heard that primer is difficult to clean up or has strong odors. That is true of oil-based primers, but latex (water-based) primers are just as easy to use as paints. Oil-based primer is useful in situations with severe stains, peeling paint, or other tough situations. It’s not necessary for most projects. Latex primer is sufficient and much easier to work with. 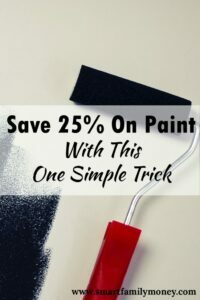 How Can You Save 25% On Paint Costs? Choose Your Paint Color. Select your paint and ask the associate to tint it for you. Get Primer To Coordinate. Select a water-based primer (Kilz or Zinnser are popular brands). Ask the associate to tint the primer to coordinate with the paint. Put Primer on the Walls. Put the primer on the walls, just as you would paint. Paint the Walls. Paint the walls, and enjoy! I used to think primer was just for new walls or tricky painting situations. Now I’ve embraced it as a great way to save money AND time! What about you? Do you use primer when you’re painting? Please comment below!